Fish embryo development. Light micrograph of a section through a fish embryo during the early stages development. The cells here are known as blastomeres. Blastomeres are produced through cleavage, a type of cell division, of the ovum after fertilisation. Many blastomeres make up a hollow sphere of cells known as the blastula (seen here). Here, the cell at centre is in the anaphase stage of mitotic division. 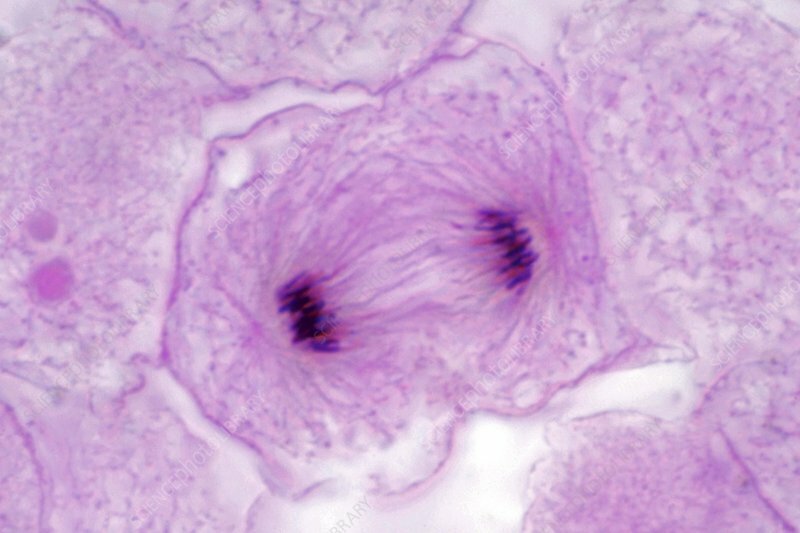 The chromosomes (dark specks) are visible in the nucleus (centre) where they have been pulled apart by the microtubules (spindles, lines). Magnification: x1670 when printed 10 centimetres wide.